We all see them: A beautiful black cat sitting on a fence, a furtive tabby darting down an alley, a ginger tom peeking from a bush. More than 40 percent of Americans have fed a stray cat. But the compassion for outdoor cats can’t stop there. Of the estimated 83 million stray and feral cats, only two percent are neutered. That’s a lot of cats and kittens not experiencing the benefits your own cats enjoy from spay/neuter. Scientific studies have shown that neutering significantly improves feral cats’ lives: the population is immediately stabilized—no more kittens! And, their weight and coat condition improve, and the cats are more affectionate towards each other, which means less fighting and better health. The protocol for feral cats is called Trap-Neuter-Return (TNR). TNR is the humane, effective approach where feral cats are humanely trapped in box traps, neutered, vaccinated, and eartipped. Socialized cats and kittens can be placed in adoptive homes, and feral cats— unsocialized to people—¬are returned to their outdoor colonies. • DON’T call animal control. Feral cats can’t be adopted, so they are better off being neutered and returned to their outdoor home through TNR. Sadly, most Americans don’t know that calling animal control results in the cat being caught and killed. • DON’T bring the cat to a shelter. Nationwide, seven out of every ten cats entering shelters are killed. 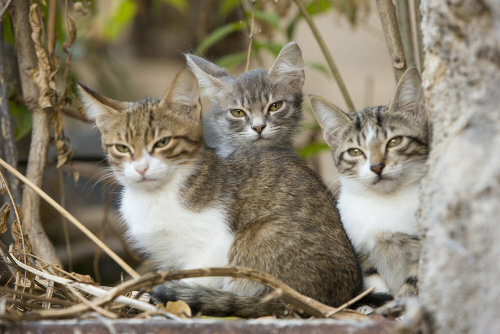 For feral cats, this number rises to 100 percent because they cannot be adopted into homes. • DON’T try to touch the cat, no matter how friendly that pretty kitty seems when she is on your porch awaiting dinner. • DON’T try to get the cat into a carrier. It will be ugly! Buy or rent a humane box trap, which you can learn how to use through the TNR resources below. • Start doing TNR. Visit www.alleycat.org/TNR to learn how. In addition to step-by-step instructions, we hold regular monthly webinars to show you how to help cats in your community. • Act now. You may associate kitten season with spring, but this is a crucial time of year for spay/neuter. • Spay/neuter kittens. When we find a tiny kitten, the need for preventing litters can seem ages away, but female kittens go into heat as early as five months old. Don’t wait! Kittens can be safely spayed or neutered as soon as they weigh two pounds, which is when they are about two months old. • Find local spay/neuter resources. Research TNR options at www.alleycat.org/Response. Becky Robinson is president and co-founder of Alley Cat Allies, the national experts on Trap-Neuter-Return.